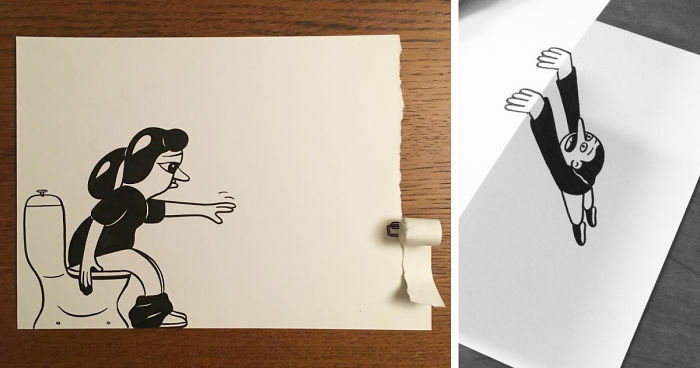 Danish artist, HuskMitNavn, has taken his playful black-and-white drawings of things as simple as opening a can of food, or as frustrating as running out of toilet paper, and brought them to life as incredible pieces of 3D cartoons on one sheet of paper. The artist merges the 2D and 3D worlds by folding or tweaking the paper in such a way, that it sees these lively cartoons literally jump off the page. In fact, we like HuskMitNavn’s drawings so much, that we urge you to check out his Instagram and Tumblr accounts! I love artist that can do perspective work like this. All of these are soooo clever!!! He looks like he's rolled up in the sand like a sand mummy! This one is very a-peeling. Not much of an upside here. Am I the only one that thinks this is creepy? This is my favourite! The detail on the newspaper! Oh, it snot that cold! History in 3d..i bey they didnt see it comming. That's a tall mailbox. Very cool though. I like the character i mean your style of cartoon, it's funny, simple, strong and remaind me of my old favorite comic. Oohh i like this one. Goin for a hike, just me and the backpack..
"Uh, yeah, could I get a pound of hamburger, please." "That's it, I'm leaving and taking my home with me!" he's hitchiking at the wrong side. I was there for 6 years. I am one of the lucky ones. I love how underneath the paper it looks like a shadow. Must have don some serious homework getting that paper ball hanging. Wow!!  Sir, you are AMAZING!! good job dude these are really clever! Looks like Mr. Kokoschka from Hey Arnold! Yeah, just a little off the ends, please. "Oh Lets go fly a kite "
That must why we dont see them out there..they are always observing from a safe distance. "Nope! Super powers don't cover flying." Brocken spray paint..i can relate.